It's the third day of autumn and it feels damned warm out, 26C! On hot days like today, I crave a citrusy Belgian beer. 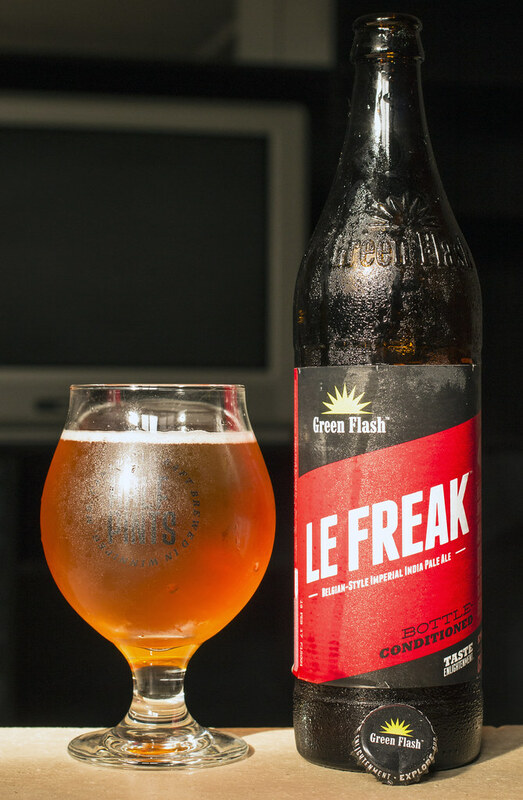 Well, there wasn't anything really Belgiany that I could review, so I'm settling with San Diego's Green Flash's Le Freak, which is a Belgian-style Imperial India Pale Ale. In the continuation of brewers desires to create a Belgian meets IPA hybrid, this one is a hybrid of a Belgian-style tripel meets an American Imperial IPA. The brew contains Amarillo hops to give it a zesty taste and dual-yeast fermentation. Appearance: It pours a honey-amber ale, fairly orangish. Reminiscent of well.. both an American IPA and a Belgian tripel. At the pour, I got a decent amount of white head, but it quickly diminished into nothing at all.. so there's only a hint of head surrounding the edge of the glassware. Aroma: Firstly, I'm getting a bitter, herbal and citrusy aroma from the Amarillo hops - a bit of the typical piney bitterness you typically get in an American IPA. Following the hops there's a very sweet, syrupy caramel and dark fruit sweetness that could be attributed to both the fact it's an Imperial IPA and that it's supposed to be a tripel at the same time. A light amount of pepper gives it an interesting spiciness, fairly yeasty and bready and has smells that remind me of my favourite cologne (herbal, citrusy). I feel that the beer balances Belgian and American aromas quite well as you can actually pick out individual scents that would generally be attributed to one style over another. Very sweet, malty and hoppy from the Imperial IPA while citrusy, yeasty and parfumic from the Belgian influences. Taste: I'm getting both a yeasty kick as well as bitterness of the hops at the exact same time on my first impression. It's got the dark fruitiness I know and love in Belgian ales while it's moderately bitter, spicy and citrusy from the American Imperial IPA side of things. Together, it gives off a mashup of lots of different flavours all over the place. This is probably one of the most interesting Belgian-style India Pale Ales I've had yet as this isn't an overly thick, yeast in your face but with a liberal helping of hops, this tastes like two beers were collaborated into one. Lots of citrusy lemon, sweet honey, bitter pine (and peppery) hops from the Amarillo and a touch of syrupiness to go with it all. As syrupy as I find it, it's pretty easy to drink.. aside from the eventual esophagus burn it will give me. Overall Thoughts: This is a REALLY GOOD Belgian-style Imperial IPA, it hits the bullseye for not only keeping Belgian flavours and aromas intact, but the hops compliment the beer in a way that it works out really well. I really like Green Flash's offerings but unfortunately I can't get their beer in Manitoba yet, so I have to drive down to Minot, ND if I want more of their beer. What surprised me when I first looked at the bottle is that the best before date is in 2017! As this is a bottle-conditioned beer, I guess the Belgian side of things allow for the beer to age gracefully compared to the true American-style Imperial IPAs.